Now that we have planned all of the enemy paths, and planned some missions for our enemy hierarchies, we will cancel the Missions, so that they are not executed until the proper trigger is met. When a hierarchy's Mission is canceled, it remembers all of the settings you gave it, including objectives and locations picked on the map. When the Faction AI re-initiates the mission, the hierarchy will default to its last Mission settings, and the Mission will be conducted just as you planned it. 1. 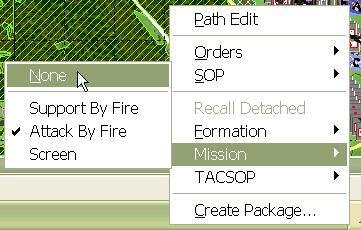 Right-click on a hierarchy and select 'None' from the 'Mission' submenu. The unit's mission will be canceled.